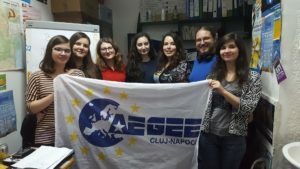 AEGEE-Cluj-Napoca proposed some local and international events during the year but their most successful one was a conference organised last May, shortly before Agora Bergamo. 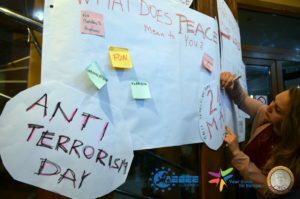 We collected some information about the topics discussed in the conference organised by the Romanian Antenna, whose Main organiser was Bianca Sabau. The content of this event was built by the Your Vision For Europe project team and the Association des Amis de Franck Biancheri. 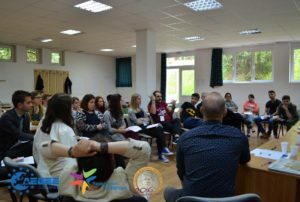 The Franck Biancheri Award Conference “Borderless Europe: Blessing or Burden?” was held in Cluj-Napoca, in the heart of Transylvania (Romania), between the sixth and ninth of May 2016, gathering around sixty organisers and participants from all over Europe and beyond. The event counted on the collaboration of the Association des Amis de Franck Biancheri (AAFB), and its 45 participants made it highly “international” [Romania, twenty-one; Germany, ten; Italy, three; Macedonia, two; Hungary two; Croatia, two; Bulgaria, one; Pakistan, one; Nigeria, one; Greece, one; and the Netherlands, one]. 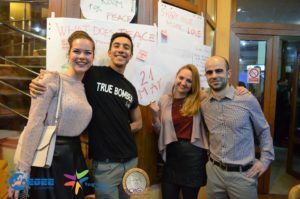 Fifteen members of AEGEE-Cluj-Napoca took care of the logistical aspects of the conference. Nine speakers shared their expertise and ideas during the panel discussions. 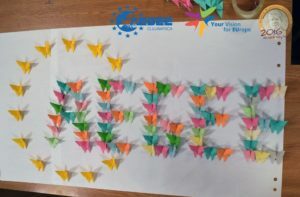 Six delegates of the Your Vision For Europe project presented and delivered in Cluj-Napoca the content of the conference: Maarten De Groot, Aleksandra Mojsova, Leonie Riebesam, Tedi Martinescu, Cosmina Bisboaca and Roberto Orrù. Two members from the Comitè Directeur, Aleksandra Kluczka and Réka Salamon, coordinated and supervised the organisation of the conference, and Marie-Hélène Caillol, Marianne Ranke-Cormier and Georgeta Grama Moldovan were the representatives of the AAFB. The association financially supported the conference and shared the spiritual legacy of Franck Biancheri, the founder of AEGEE. 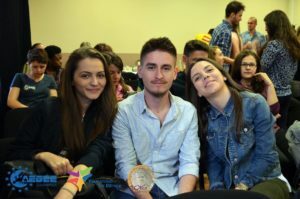 As the Franck Biancheri Award 2016 was awarded to AEGEE-Cluj-Napoca, the conference was also an occasion to commemorate and discuss the life and cultural legacy of Franck Biancheri, who, during the 1980s, was a promoter of a transnational democratic Europe. The meeting began with a presentation about Franck Biancheri’s life and decisive role for the birth of the ERASMUS Programme. Throughout his life, Franck strived for a more democratic and transnational Europe and, in 1988 and together with other AEGEE founding members, he created the first trans-European political party, called “Initiative pour une Démocratie Européenne” (IDE). Although formally dissolved after a few years, the spirit and ideas of IDE have been inherited by a new party founded by Franck and other fellows in 2005: the “Newropeans”. Today, Newropeans remains the only trans-European political party. Franck’s work and thoughts about the future of European governance and the role of Europe in the world continued with the creation of Europe2020, which afterwards became LEAP (Laboratoire européen d’Anticipation Politique). The second part of the ceremony was dedicated to the history of AEGEE: from its birth in Paris on the 16th of April 1985, when it was still called EGEE, to when it changed its name to AEGEE in 1988, until the present. Its foundation started with the purpose of creating a platform, a forum for young Europeans to discuss about European matters, and where they could propose their ideas to both national and European institutions. In 1986, about fifty university antennae were present in Europe; today the AEGEE network is present in two-hundred cities, spread over forty countries in Europe, and counts 13,000 members. During three days of workshops, panel discussions, and the screening of the “Great European Disaster Movie”, the participants discussed the current state of the European integration process, its political and moral crises, and how the EU is dealing with the current migration phenomenon. The major topic of the conference was “borders in Europe”; physical, socio-economic, cultural or political. This led to a debate regarding the current state of the Schengen agreement, the idea of a borderless Europe and how it can be transferred to social and institutional terms. Lastly, the participants proposed some solutions in order to break borders and stereotypes. Participants of the conference were given the opportunity to help Maarten De Groot’s team measure the impact of the conference and the project. Participants were given a questionnaire before the start of the conference and another after its end, to see if their opinion had changed. Certain measures were repeated, giving the team the opportunity to check the changes brought about by their conference. On the 7th of May, the Your Vision for Europe team and Aleksandra Kluczka held the workshop “Borderless Europe vs. Borders in Europe”. Having the complex, diverse notion of Europe and its borders, participants explored what Europe and the European Union mean for them, how they affect them personally and what it means to feel European in an interactive, non-committing manner. Furthermore, participants explored how the ideal of a borderless Europe materialised historically and which were the milestones of the European integration process, the most important moments of integration deepening and co-operation strengthening, and the moments of widening of the circle of member states. This workshop was introductory and intended to actively engage participants in an accessible and informing way. The second one was called: “Our Image of Refugees: Change of Perspective?”, presented by Fabian Wagner (Federation of the Young European Greens) and Aleksandra Mojsova (YVfEU). During this workshop, participants and trainers critically explored the concept of a borderless Europe, and the different aspects it brings. Questioning the differences between experience and acquired information, they examined the process of how people’s attitudes are shaped and how this process is hugely influenced by the media. Very often, this leads to socio-cultural borders, most implicitly creating mental borders, unnoticeably shaping views for many people on multiculturalism, integration, social coexistence and social cohesion. The next workshop, “Socio-Cultural Borders in Europe: the Borders That Define Us”, trainers Noemi Lowy (Democracy in Practice) and Roberto Orrù (YVfEU), started with a role-play game, in which the AEGEE members had to represent various political parties and associations of a fictitious multicultural city, such as a Muslim party, a youth association, a far-right party and many others. Together, they discussed and voted in favour or against the construction of a new mosque in the city. By putting themselves in the shoes of “the other”, participants experienced different values, points of view and beliefs, after which they attempted to break socio-cultural borders and to challenge prejudices within the setting of a multicultural society. In the second part of the workshop, participants developed and shared ideas about the cultural, political, historical and geographical borders that define a social community and their positive and negative effects. On the 8th of May, the workshop “Issues Without Borders’ Petition: IWB for Refugees! Europe Needs New Legislation on Migration”, presented by Patricia Papuc (Issues Without Borders), was an open discussion about different aspects of the refugee crisis and the problems in the different countries the participants belonged to. Patricia Papuc gave a short introduction on the work of Issues Without Borders. Other aspects that were discussed are the practice of sanctions within the EU, their effectiveness and ideas for other methods that could control the actions of member states. The trainer talked briefly about the EU-Turkey deal as well as the quota system and whether or not the participants feel powerless about the refugee crisis. The general feeling was that the problem is so complex that citizens cannot do much, except for offering individual help to some refugees. That same day, there was also the workshop: “Socio-Economic Borders in Europe and the Idea of a Universal Basic Income”, by Antonis Triantafyllakis (AEGEE Mobility Working Group), which dealt with the idea of a basic income. Countries like Finland and Switzerland, for example, are considering to implement this within a few years. The major focus of the discussion was employment. Most of the participants admitted that, when choosing their field of studies, they also considered their chances of getting a job after obtaining their degree. Furthermore, participants talked about the fact that automation is changing the labour market and the kind of skills that a job-seeker needs to have. One thing is certain: automation generates less jobs than before. At the end of the workshop, a comparison has been made between the welfare systems in the participants’ countries. The first panel discussion was called “Europe in crisis, Schengen in suspension”, and the first topic was the crisis that EU faces today, not only politically but also morally. The factors that caused this crisis might be found in the EU’s democratic deficit and in the failure to implement fundamental EU values, such as respect for human dignity and human rights. This failure appears clearly through the way the EU is dealing with the refugee crisis. The second topic discussed was the Schengen agreement and whether this agreement is necessary for the success of the European project. The group concluded that there is a need to maintain Schengen, since it is one of the biggest achievement of the EU. Schengen gives us a sense of community, it helps the EU to stay united and to act as a global player in the international arena. During the panel discussion, “A Leap of Faith – Utopian Thinking and Acting in 21st Century Europe”, perspectives were exchanged on how the future of the European project should look like. The panellists pointed out a number of developments that should give us reasons to be hopeful, such as the possibilities that the Internet gives everybody, the idea of a Europe-wide Universal Basic Income and the recent introduction of the European Citizens’ Initiative. The idea that was discussed most extensively was the role of cities as drivers of societal change: it is in cities that all relevant stakeholders are gathered in one place – universities, businesses, NGOs, local authorities and communities. Moreover, AEGEE is the living example that you do not need to be organised at a state level in order to have an effective co-operation at the European level. The idea of a world parliament of mayors was coined as an ideal that is not all that far-fetched, if one reads Benjamin Barber’s If Mayors Ruled the World and follows the initiatives he carried out. Afterwards, the participants enjoyed The Great European Disaster Movie, directed by Annalisa Piras. In the “Europe for all, all for Europe!” session (World café), the team of Roberto Orrù focused on what everyone can do to influence politics and to have an impact on a more borderless Europe. In order to influence politics we have to be active citizens: that is to actively participate in youth organisations; get in contact with politicians and stakeholders, and invite them for conferences and discussions; sign petitions and protest in the streets. Other ways to affect politics are using online tools such as social media to spread new ideas and to connect with other people; organising conferences and help others to be active citizens themselves; improving our communication skills and being good ‘storytellers’. 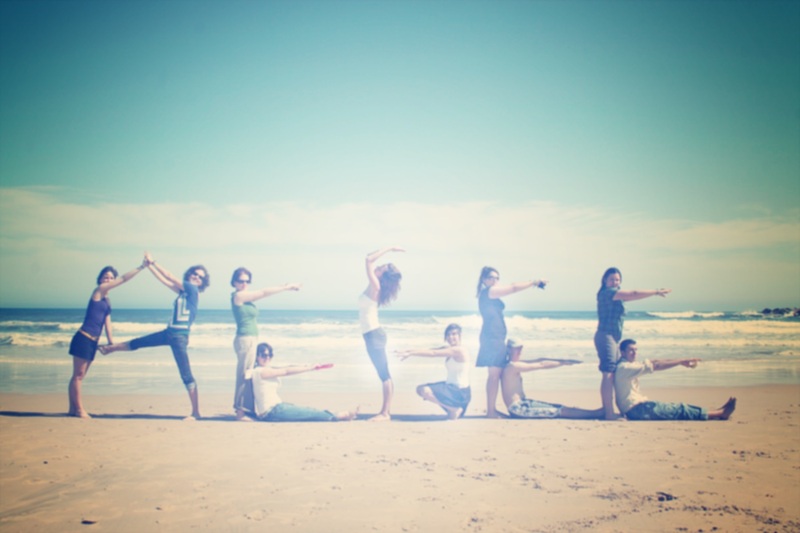 Only through an effective communication, we can transmit our messages. In order to reach a more borderless Europe, the participants proposed to: organise international cultural exchanges; improve and allocate more financial resources for the Erasmus + programme; advocate for the expansion of the Schengen area and for less visa regulations; improve English language classes in schools and universities; and raise awareness, both through informal talks with friends and by undertaking symbolic actions such as occupying borders and checkpoints. In the second part of the workshop, five different groups focused on cultural, political, external and socio-economic-borders. The main issue identified within the political borders is the European citizens’ disinterest toward European politics and their lack of representation (democratic deficit). A proposed solution could be a sort of direct e-democracy tool, an online application through which citizens can have their say about a specific topic or question proposed by the European Parliament. The main issue found in external borders relates to how EU is dealing with refugees. In order to raise awareness about the refugees’ situation and fight stereotypes, this group proposed to contact refugees, interview them and share their stories. This project could be called “Faces of Refugees”. One group dealt with cultural borders; the traditions, lifestyles and stereotypes that apparently prevent different cultures to communicate with each other. In order to promote respect and tolerance toward other cultures, this group proposed that through youth associations, NGOs, schools and universities we can enhance and develop cultural exchange initiatives. These initiatives might be festivals, food tasting sessions, film-nights and post-screening discussions. A second group that examined cultural borders focused on tackling prejudice by organising cultural exchanges through schools, universities and within the Erasmus programme; increasing foreign language courses and offering evening classes; expanding freedom of movement; raising awareness about other cultures through social media; and enhancing the role of NGOs. Socio-economic borders have been tackled in a more general and philosophical way, by trying to reach a situation of well-being, meant as a status in which people live their lives with dignity and safety. Citizens might be trained about social and economic issues in many ways: education through formal and non-formal sessions in schools or universities; visiting local and national authorities, working with them on social issues and publishing the results through social media. 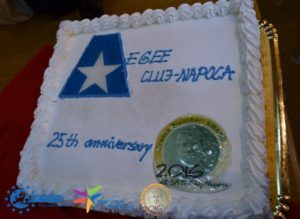 The end of the conference was a great occasion to celebrate the 25th anniversary of AEGEE-Cluj-Napoca with a gala, to which they invited everyone who helped them to grow. 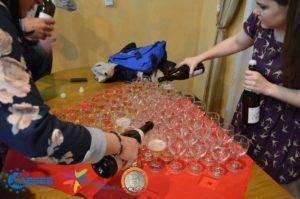 They were granted diplomas and celebrated the anniversary with cake and a party. Bianca Sabau, the main organiser of the Borderless Europe Conference, told us the new Board is preparing the activity plan for the following period, so we’d better stay tuned. Written by Matteo Lai, AEGEE-Cagliari.